The Windows Mobile operating system from Microsoft runs on hundreds of different devices today, including many commercial and professional grade devices. 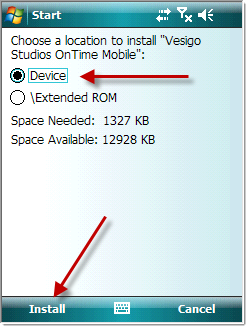 OnTime Mobile is available as a free application that can be installed onto a Windows Mobile device either via a USB connection to a computer or directly from the OnTime web site. OnTime Mobile for Windows Mobile offers a comprehensive set of features including barcode scanning, digital signature capture, and the ability to work offline. All essential information and functionality, including two way communication, is included. More sophisticated features, such as signature capture and GPS tracking, are included if the device supports them. The features are very similar across both version, with the exception of touch screen features such as digital signature capture. Requires: Windows Mobile 2003/2003 Second Edition/5/6/6.5 for Pocket PC or Pocket PC Phone Edition (Classic and Professional). This installation is for classic Windows Mobile, not Windows Phone or Windows 10 Mobile. The easiest way to install the application is to do so directly on the device. 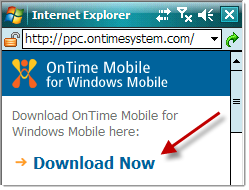 Do this by starting Internet Explorer on the Windows Mobile device and navigating to this web site address: ppc.ontime360.com. On the resulting web page, click the Download Now link. 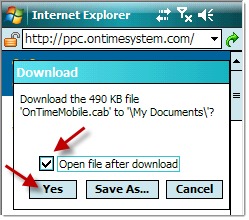 When prompted, ensure that the Open file after download option is checked and then tap the Yes button. If prompted where to install the application, normally the default option, such as Device, is the best choice. Installation will proceed for a few moments. 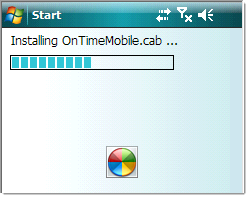 Tap the OnTime Mobile icon to launch the program. Once loaded, sign in with your driver credentials. 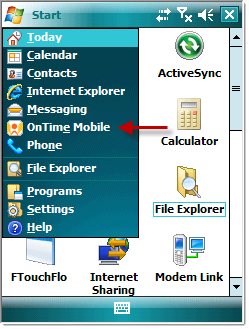 Connect the Windows Mobile device to a computer and establish a connection between the device and computer using either ActiveSync (Windows XP) or Windows Mobile Device Center (Windows Vista/7). Click here for more information. 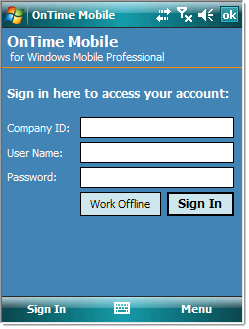 Scroll down the page until you see OnTime Mobile for Windows Mobile. Click the button labeled Register to Download Now. Complete the registration form and click the download button to download the installation file. Once the installation file is downloaded, launch it. The installation wizard will appear. Click the labeled Next. 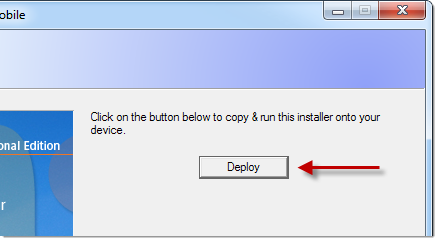 Click the button labeled Deploy as shown below. This will send the files to the mobile device and begin the installation on the device. 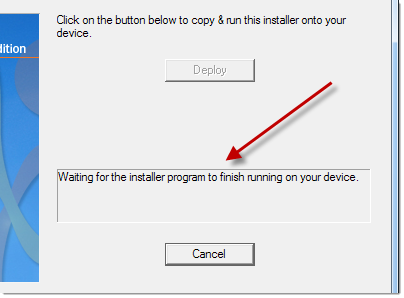 Close out the installer on the computer by clicking the Next button and then closing the installation wizard. 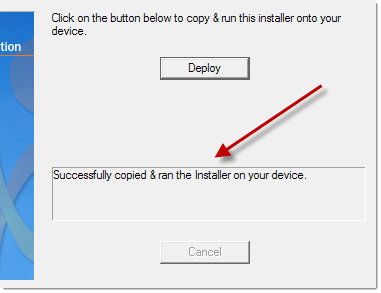 If you are installing to a Windows Mobile Standard device (without a touchscreen), follow the instructions above for "How to install via a USB or Bluetooth connection". If difficulties arise, please contact technical support for assistance in obtaining the setup files for such devices.